Final Run 30th Anniversary Custom 24s! And to mark the occasion, we’re releasing a very special ‘Final Run’ edition of the stunning 30th Anniversary Custom 24 model – the classic PRS with tasty anniversary appointments including 85/15 humbuckers, rosewood veneer headstock inlay and fingerboard purfling. The Final Run model (of which just 100 will be built) sticks closely to the original 30th Anniversary Custom 24 blueprint, but is available (exclusively in Europe and Australia) in five amazing colours previously unavailable on the 30th Ann CU24 – Burnt Maple Leaf, Charcoal, Fire Red Natural Back, Faded Blue Jean and Yellow Tiger. Each of the Final Run guitars will also be numbered and signed by Paul Reed Smith. Here’s the Final Run 30th Anniversary Custom 24 in glorious Burnt Maple Leaf..
https://www.prsguitarseurope.com/wp-content/uploads/2015/10/PRS_Final_Run_30th_Ann.jpg 1439 3000 Kieran Morgan http://www.prsguitarseurope.com/wp-content/uploads/2014/06/340-300x137.jpg Kieran Morgan2015-10-21 11:09:572015-10-21 11:19:28Final Run 30th Anniversary Custom 24s! Limited Edition SE A10E Acoustics For Europe! 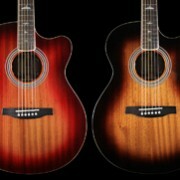 We’ve been really pleased with the way the press and public alike have taken to the SE A10E acoustic. It’s been warmly-received by players and magazine writers for its mid-rangey, punchy tone – which is down to its all-mahogany construction and X-bracing/classical hybrid bracing. And now we’re delighted to have a limited edition run of these lovely guitars heading to Europe. We have a single batch of this run – when they’re gone, they’re gone – available in four stunning colours. And they’ll only ever be available in Europe! In terms of design and build, they stick faithfully to the original A10E, which means mahogany top, back, sides and neck, rosewood fingerboard, bone nut and saddle, PRS-designed tuners and PRS’s trademark bird inlays. The SE A10E is also fitted with undersaddle electronics that are accessible via the soundhole with both tone and volume controls. The limited edition SE A10E run encompasses four stunning colours – Antique White, Cherry Sunburst, Tobacco Sunburst and Vintage Cherry, available at a recommended retail price of £499 / €699. 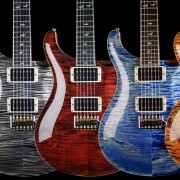 https://www.prsguitarseurope.com/wp-content/uploads/2015/10/PRS-SE-A10E_LTdCols_500.jpg 181 500 Kieran Morgan http://www.prsguitarseurope.com/wp-content/uploads/2014/06/340-300x137.jpg Kieran Morgan2015-10-01 20:48:492015-10-08 10:58:54Limited Edition SE A10E Acoustics For Europe!